These came from one border spadeful. and decided to put in a couple of raised vegetable beds. 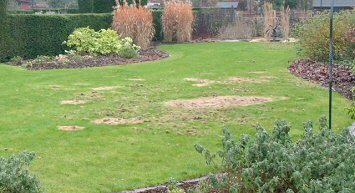 Incidentally the RHS tell us that a badly nourished lawns are the most susceptible to these little perishers, and we found seaweed granules a great help in getting the lawn back into shape. The grown up Chafers are no real problem, and can be quite a sight really as they come out of the lawn May or June time. You are probably seeing Phyllopertha horticola, which has a greeny coloured head and the welsh chafer, Hoplia philanthus which has a black head. They can make quite a swarm if the turf was really infested. Although they can nibble at a few leaves, they really are coming out to “party” - if you see what I mean. Females then go back to your lawn, and lay loads of eggs in the soil. A couple of weeks later the grubs are hatched, and get feeding on your roots right away. By the way, they love moist ground, even delaying hatching during drought - bit of a mystery why they hatch so quickly in the UK ! The grubs are a nuisance, but just wait until they become fully grown larvae. Hulking great brutes, much bigger than their parents. Lying in your bed all day, eating , eating - and eating ! One thing about these kids - they are not fussy eaters. until, in the spring, your lawn will look like this. 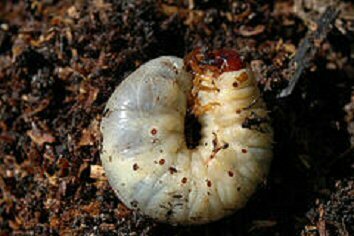 Don’t worry though, there are two easy ways of sorting out chafer grubs. There is the chemical way with Imidacloprid. It’s quite safe, they tell us, even though it comes from nicotine. No, it’s fine to use, just don’t worry about it containing our old friend crystalline quartz silica. I mean what does the National Toxicology Program in America know - saying “ it’s known to be a human carcinogen” indeed ! Well, and as for them also saying naphthalene, another ingredient, shows ‘clear evidence of carcinogenic activity’ have they carried out extensive tests or something ! What worry guts that old NTP - Oh, and the International Agency for Cancer - really are ! They’re just like that American Environmental Protection Agency - we all know those Americans exaggerate, Imidacloprid varies wildly in its effect on wildlife. O.K. 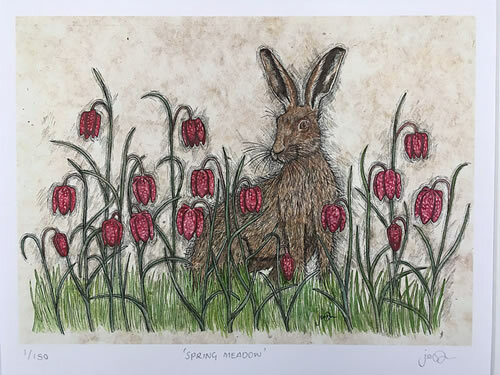 it’s highly toxic to sparrows and pigeons, and a total no - no ( translation “acutely toxic” ) to bees, earthworms, ladybirds and lacewings, but it will get your chafer grubs. And those rumours of egg thinning, inability to fly, fewer birds hatched etc, etc - well they came about after only a few investigations. Bet there were only a few investigations too which proved ‘extreme toxicity’ to fish and shrimps and things - I mean who has those in the garden. Well, for some reason we decided not to use Imidacloprid. So what’s the other way of sorting out these Chafers ? With them Heterorhabditis megidis nematodes of course. Doesn’t everybody know that ! Actually, we didn’t until we did a bit of research and discovered nature can help - again. Well you did ask ! 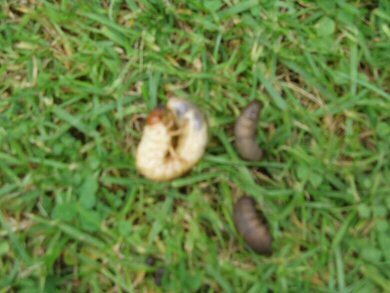 As with all of the pest controls we offer here, these nematodes are harmless to everything - apart from the Chafer grub. 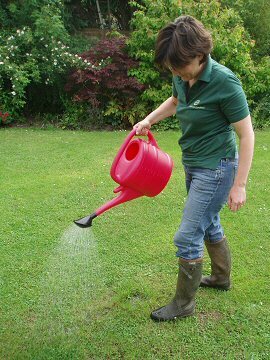 You just mix them with water, and apply it with a watering can during late summer and autumn. It is best to do it on a non sunny day ( difficult to find in the UK I know ) so it will not dry out straight away. These tiny little creatures will get straight to work. As always, there will be full instructions with the packet - including asking you to refrigerate until you are ready.